Team No Trade Gronk. No Trade! Make Gronk Sad. Rob Gronkowski’s offseason of uncertainty ended with the lovable galoot coming back to the Patriots on a reworked, healthier contract, for at least one more run at a championship with Bill Belichick and Tom Brady. Part of Gronk’s existential mulling seems to have come from disillusionment with the Patriots organization—Tom E. Curran said in February that “the atmosphere at Foxboro” was ““starting to wear on [Gronk] mentally and physically”—but more than $4 million in achievable bonuses seems to have done the trick. During the offseason, while he stayed away from the team and mulled retirement, the Patriots engaged in trade talks centered around star tight end Rob Gronkowski. They had several interested parties, and at one point, it appeared a deal would get done to send Gronk to a new team, sources say. But when Gronkowski learned of his new reality, he strongly resisted. He informed the Patriots that he would rather step away from football and retire than play for another team, coach or quarterback. He told people close to him that he only wants to catch passes from Tom Brady. There’s context worth unpacking, in there. 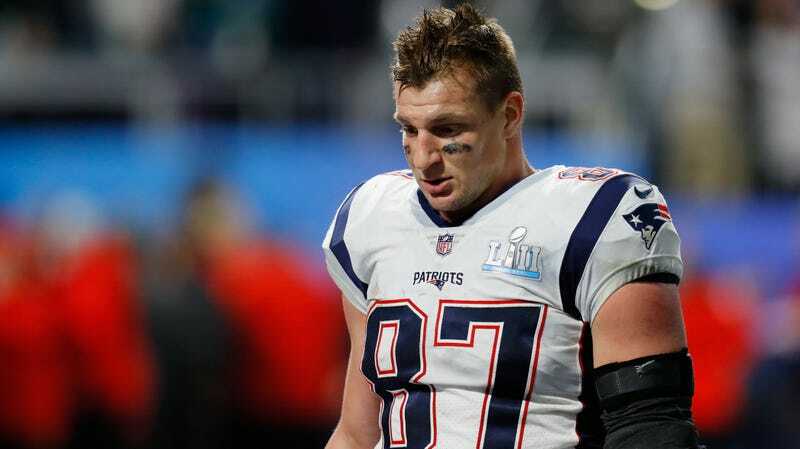 Gronkowski was reportedly unhappy with the Patriots following last season, which ended with the bitter disappointment of a Super Bowl loss. The Patriots then shopped Gronk around to potential trade partners, but Gronk shot down any potential trades by insisting he wouldn’t play for another organization. Eventually the two sides found common ground and Gronk’s enthusiasm for playing for the organization was reinvigorated, and oh by the way that came with a renegotiated and fairer contract for a player coming off a Pro Bowl season. Gronk said his contract situation wouldn’t be a sticking point with the team, but it’s possible to read this as Gronk using retirement talk as a way of leveraging a better contract out of the Patriots organization. Of course, that assumes a level of organized thought several orders above Gronk hungry and Gronk make touchdown, so it’s entirely possible the additional money really is just a coincidence. Maybe Gronk doesn’t even know about it! At any rate, a face-to-face meeting with Bill Belichick ultimately reaffirmed the two sides’ mutual commitment, and Gronk will open his ninth season in Foxboro Sunday afternoon, against the Texans.